Home / diet and nutrition / fedor emelianenko / MMA / primal / ufc / UFC Coach to Fedor, "Go Paleo!" UFC Coach to Fedor, "Go Paleo!" 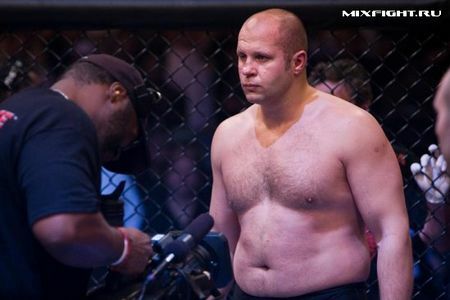 Jimmy Greninger, Head Ultimate Trainer at the first UFC Gym, Captain of the UFC Competition Team, and coach at Diablo Crossfit, recently issued a challenge to the former heavy-weight MMA king (or should I say "Emperor") Fedor Emelianenko. "Everyone knows that Fedor is a phenomenal athlete: He's fast, powerful and explosive. But if you look at his frame and body composition, he's only a six-foot tall heavyweight and fights around 233 pounds. In my opinion, he's too small for heavyweight in this era of the "Super Athlete," thus the urgency to move to 205 where he can be a serious threat for the next few years. With proper nutrition and new methods of strength/endurance training I can have Fedor walking around lean and mean at 215 pounds, and ready for the last 10 pounds of a water weight cut -- and I can do it in less than six months." How does he propose to make these changes to the famously chubby Fedor? Simply put, "The Caveman Diet." Foods that would make the cut include: meat (buffalo, elk, venison, chicken, turkey and fish), free-range and Omega-3 enriched eggs, fresh veggies ("spinach, broccoli, asparagus, zucchini, squash, etc. "), fruits, and raw nuts and seeds. And while he does say that Solid food is always better", Jimmy recommends some performance boosting supplements like Omega-3 fatty acids, Beta-Alanine, Glutamine and BCAA's because "we continue to evolve and science has come up with ways to get the nutrients back into your cells faster for better recovery and performance." From the looks of it, Jimmy has also partnered up with Bob Fritz, the creator of Muscle Milk and author of an upcoming book on the Paleo diet, so I'm sure we'll be hearing more from him in the future!